Americans of late have taken to waving the Constitution in the air and proclaiming, "The founders were on MY side See, it's all right here " But these phantom constitutions bear little relation to the historical one. 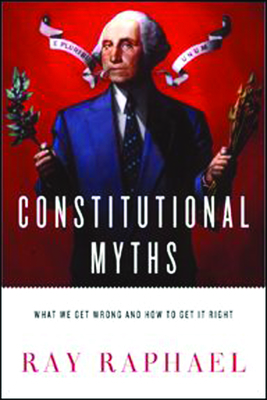 By entering the world of the Constitution's framers, and experiencing it one day after the next as they did, Ray Raphael helps us understand how and why they created the document they did. Casting aside preconceptions and commonly held beliefs, he asks provocative questions that get to the heart of the document and its purposes: Was the aim of the Constitution really to limit government? Why didn't the framers include a Bill of Rights? Did they hate taxes? Was James Madison actually the "Father of the Constitution," as proclaimed in our textbooks? Can we find the true meaning of the Constitution by reading The Federalist Papers or by revealing the framers' "original intent"? The answers to these questions are bound to surprise and enlighten. Before we can consider what the framers would do if they were alive today, we first need to see what they did during their own time, not in our terms, but theirs. Only then can we begin to resolve the sweeping question that affects us all: what does the Constitution, written at a different time, mean for us today? With this meticulously researched historical tour de force, Raphael sets the record straight--and sounds a vital call for a reasoned and evidence-driven debate about our founding document. Ray Raphael is a Senior Research Fellow with Humboldt State University in Northern California. His sixteen books include A People's History of the American Revolution; Founding Myths: Stories That Hide Our Patriotic Past; and Mr. President: How and Why the Founders Created a Chief Executive.